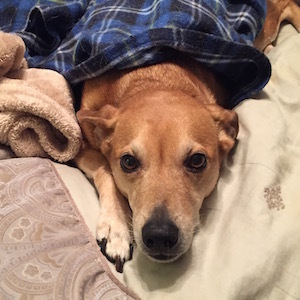 There was a treasure trove of information on each of our three themes, but it was not very well-organized. I combed through notes and draft articles provided by committee members, old safety announcements from the BB, the NCJC Emergency Operations Procedures policy, and other HR documents and policies. For each edition, I organized my notes into a series of articles, which I then laid out in our standard HTML newsletter template. I created all the images and graphics, as well. All this, on top of my normal (overloaded) workload! Whew! Fortunately, though, my hard work paid off as this series of safety-themed newsletters has been exceptionally well-received by committee members, executive managers, and staff. 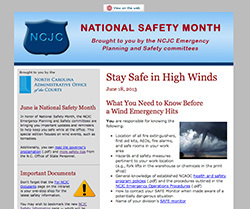 For example, a copy of the High Wind newsletter found its way to the Chief Justice of the N.C. Supreme Court’s office, and a request was made to send future editions to members of her staff. 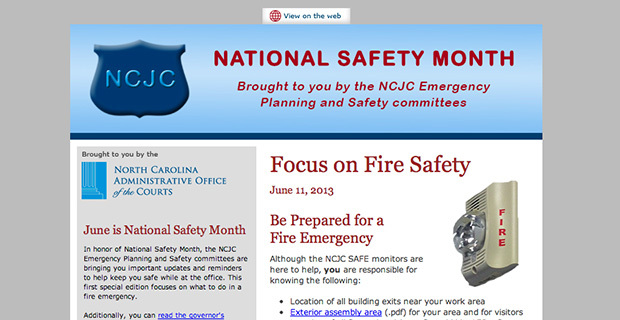 The NCJC Safety Information webpage is accessible by mobile devices during an emergency event. Also, as part of the publishing process, the committees wanted to include links to the newsletters from our static HTML intranet website (which is behind a firewall and only accessible from computers on the Judicial Branch network). That part was easy. However, they also requested that the newsletters be readily accessible by smartphones during an emergency – which posed a problem, as smartphones cannot access our intranet. 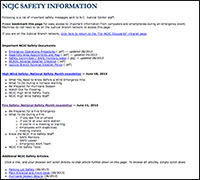 So, I quickly created a basic HTML page outside our intranet, which includes links to the safety newsletters, policies, and other information that could be important during an event.